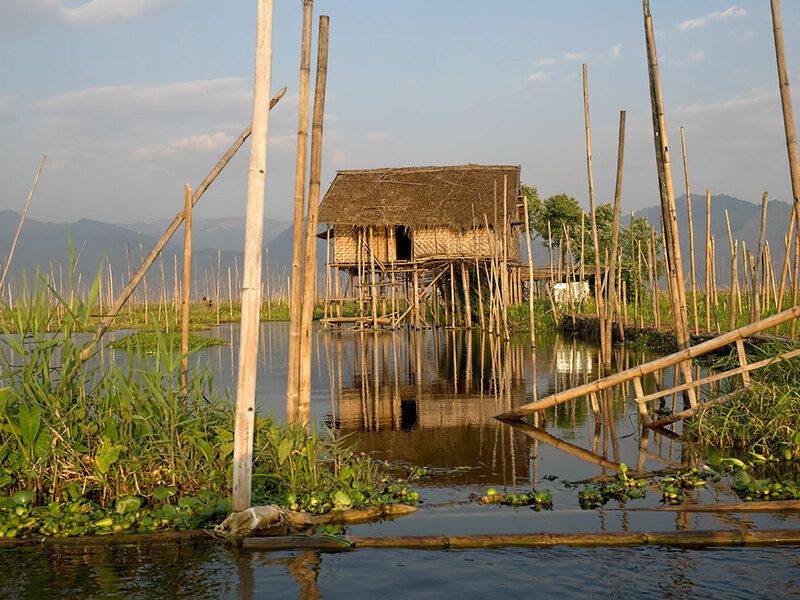 Click on title to view photo in large format: Typical stilt house on Inle Lake, Myanmar, with floating gardens surrounding the home. Entire villages are built over the lake in this fashion, complete with monasteries, general stores, schools, restaurants, and even craft workshops. The stilts must be high, as the lake level fluctuates severely between the dry and rainy seasons. The gardens are planted in boxes or nets secured to long bamboo poles that are anchored into mud at the bottom of the lake. Tending and harvesting the “fields” is also done entirely by boat. Absolutely everything is done on the water; even visiting a neighbor requires climbing into a traditional flat-bottom wooden boat, though the family laundry can be done from the front steps. This was just one of many magical sights seen during my Myanmar Explorer Cruise/Tour with Viking River Cruises. Do they have running water in these houses, if not, how does bathroom work and where do they get fresh water? Ummm…nope. A hole in the floor serves as a bathroom. Laundry is also done in the lake water. As for where they get fresh water for drinking and cooking, I suspect they bring in bottled water by boat, as it is available everywhere. Love this photo and description. It is incredible how these people live with their land (or water in this case) and even tend to floating fields! Thanks so much – glad you enjoyed it. HA! Hadn’t thought about that, Pat, and it gave me a laugh. But there are other benefits. They can wash their laundry while sitting on their porch.